The powerful germ fighting effectiveness of colloidal silver in a convenient gel form. This all-natural gel also includes aloe vera and grapefruit seed extract, both proven to have anti-microbial properties. 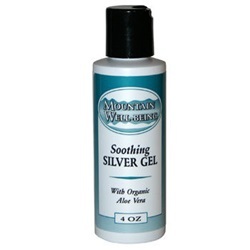 For topical use, colloidal silver gel can be used on cuts & scrapes, minor burns (including sunburn), acne, cold sores, rashes, athlete's foot, insect bites, and other minor skin irritation.